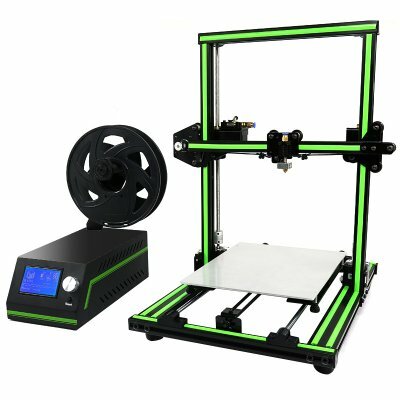 Successfully Added Anet E10 3D Printer - Large Building Volume, High-Precision Printing, DIY Design, Wide Filament Range, SD Card Printing to your Shopping Cart. The Anet E10 is an affordable DIY kit that lets you easily assemble your very own 3D printer. The kit comes with high-end aluminum components. Thanks to this, you’ll be treated to a quality end product that is capable of printing stunning objects. With this amazing gizmo at your side, you’ll truly be able to take your creativity to the next level. It will let you enter the unlimited world of 3D printing where you can create anything the mind can imagine. Whether you’re an artist, engineer, teacher, or hobbyist – this DIY 3D printer kit will treat you to year’s worth of fun to come. With its LCD display and keypad, the Anet E10 3D printer offers easy printing possibilities. It supports .G Code files and comes with a SD card slot. Thanks to this, you’ll be able to print your designs even without access to a computer. By supporting a wide range of filaments, this cheap 3D printer is sure to meet all your artistic demands. It features a printing speed up to 120mm per second, meaning that you’ll be able to create stunning objects in up to no time. The Anet E10 3D Printer comes with a 12 months warranty, brought to you by the leader in electronic devices as well as wholesale electronic gadgets..